Liz Long graduated from the University of Alabama in May 2016 with degrees in Religious Studies and Psychology. She then moved to Indianapolis with Teach for America and taught second grade and preschool for three months total before leaving the program. She now works for the Indiana Department of Child Services. In the spring of this past year, I was getting ready to graduate, and desperately searching for a job. 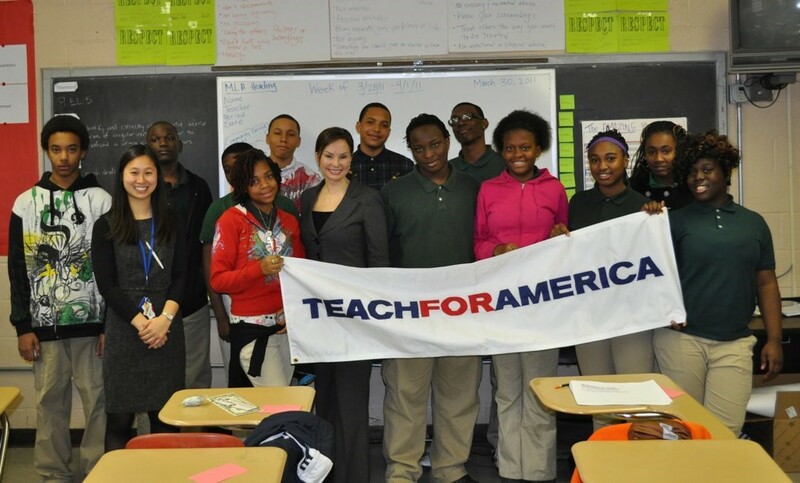 I wound up applying (and getting in to) Teach For America (TFA). So in July, after 5 (hellacious) weeks of training in Houston, I packed up my apartment and moved to Indianapolis to teach 2nd grade at a charter school here. Around mid-September, I found myself physically and mentally unable to do my job, and with extremely mixed feelings about my position, my school, and the organization I had joined. In mid-October, I left my school, withdrew from Teach for America, and started searching for new jobs. The decision to leave was difficult – I love my students, and I still have some desire to work in education – but there were a lot more factors in play. I felt unsupported and unheard by my school, and I felt like there was considerable discord between TFA’s expectations for me and the school’s expectations for me. Additionally, I felt like a hypocrite. TFA’s mission is to close the achievement gap between wealthy, white kids and poor students of color, but it felt like my school was working towards the opposite. To make matters worse, the day I turned in my resignation marked four weeks since I’d come down with bronchitis, with no signs of recovery. TFA does not adequately train teachers – the majority of TFA corps members did not get degrees in education, and TFA’s Institute (their training program) is merely 5 weeks of classes and the organization’s equivalent of student teaching. TFA corps members often do not stay in the classroom after their two years are up. Many move into positions in school leadership, or use the program as a stepping-stone to law school, medical school, grad school, etc. TFA perpetuates educational inequality by placing teachers with little training in the classroom. The American education system is one based on class and race (also see these two articles). Put simply, if you’re white or middle to upper class, your education is likely far better than it would be if you were a person of color or came from a low-income family. Some critics place a majority of the blame for the continuation of this system on TFA, for the reasons listed above. Some even take it so far as to blame individual TFA corps members for entering into a corrupt organization (one which many of us do not understand upon joining-we just want to be teachers). But simply blaming TFA for its failures obscures the larger systemic problems in American education that make TFA even necessary or possible to begin with. I can’t speak for the whole country, but I can speak fairly well for Indianapolis, though I’ve only been here for a few months. Indianapolis, like many of TFA’s placement regions, faces a teacher shortage nearly every year of 70-90 teachers. I worked with more than one person on an emergency license (meaning they also are not traditionally licensed teachers, and are often without even the 5 weeks of training TFA corps members receive). The city is also home to the Indianapolis Teaching Fellows, an organization almost identical to TFA, but the organization is much smaller. Indianapolis Teaching Fellows (ITF) also go through six weeks of training in the summer, followed by a two year placement in either a public or public charter school in Indianapolis. ITF members are enrolled alongside TFA corps members in Marian University’s Masters of Arts in Teaching program. Despite being an almost identical program, searching Google for ITF returns mostly information on the program. On the first search page, I found only one blog post on ITF or its parent organization, TNTP Teaching Fellows. If they’re such similar programs, why does TFA take all the heat? Why are there no posts about the fact that Indianapolis needs two low-income teacher training programs, in addition to emergency licensure, and still comes up 70 teachers short year after year? TFA is far from the only low-income teacher development program out there. Almost every state offers emergency licensure, alternative certification programs, or another teacher development program similar to TFA. In my eyes, this is indicative not of TFA’s ineffectiveness, but of a much, much larger problem in American education. All across the country, low-income school districts are facing teacher shortages for a number of reasons, chief among them low pay, high stress, and long hours with no overtime. After a few years, no one wants to be a teacher, so districts are forced to rely on teachers with little to know formal education in education. Even among traditionally licensed teachers, the turnover rate is extremely high. Only 50% of teachers nowadays stay in the profession after five years. Many traditionally licensed teachers note that a degree in education does not adequately prepare you to teach in a low-income setting. Yet, schools like this make up roughly 50% of American schools. Perhaps I’m a bit biased by my time in TFA, but it seems more like the public is looking for a scapegoat than providing legitimate criticisms of TFA. What is needed in American education are large-scale reforms and shifts in discourse. Many have shared these videos on Facebook comparing Finland’s treatment of teachers to America’s, and the structure of Finland’s schools. I don’t disagree with these, though America would likely need a much larger education budget in order to implement the same high pay for teachers and resources for schools – even public schools in high- and middle-income neighborhoods. In some posts to come, I’ll better outline some of the issues in American education. And none of this is to say that TFA is without flaws, because it absolutely is. But in order to get at the heart of TFA’s issues, you must first look at the system it operates in. This entry was posted in Grad Blog, Relevance of Humanities, Religion in Culture and tagged education, Indianapolis teaching fellows, Liz Long, teach for america, tntp teaching fellows by admin. Bookmark the permalink.